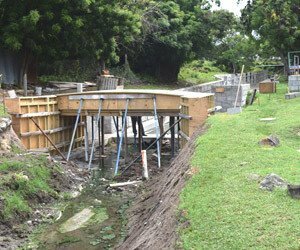 Permanent Secretary in the Ministry of Tourism Carl Williams expressed satisfaction with ongoing works in the second phase of the Bath Stream Rehabilitation Project, which commenced three weeks ago. The three-phase project is expected to be completed by the end of July. Williams made the comment while on a site visit on May 12, 2016, accompanied by the Department of Information. “I must say that the project is going quite well and the contractor Lefco Equipment Rentals & Construction Co., they have been doing a very good job. “They did the first phase here and we were very satisfied and so we felt that we should also engage them in doing the second phase,”Â he said. According to the Tourism official, the project had already seen construction of two pools in the stream. Under the second phase, a walkway is being constructed over the stream for easier access, followed by construction of toilet and change room facilities. Landscaping the area will form the third phase. He noted that once construction of the bridge is completed, the sides of the stream will be reinforced to the bridge with boulders to retain the natural look. Williams also said that there are also plans afoot to develop another existing pool along the stream. “We are hoping to expand it and then we will put a shed on it so that we can have at least two pools where we have some privacy. “Presently we have one that is covered and the other one is not covered and because of that we have a lot of algae build up on it so it’s very difficult for persons to use,”Â he said. Meantime, small business owner Eldaria Jones who has been operating at the Bath Stream for the more than two years, commended the project. She expressed the view that it brings relief to the many disabled persons who wish to access the hot springs. She believes once the project is completed it would draw many others to the healing hot springs.